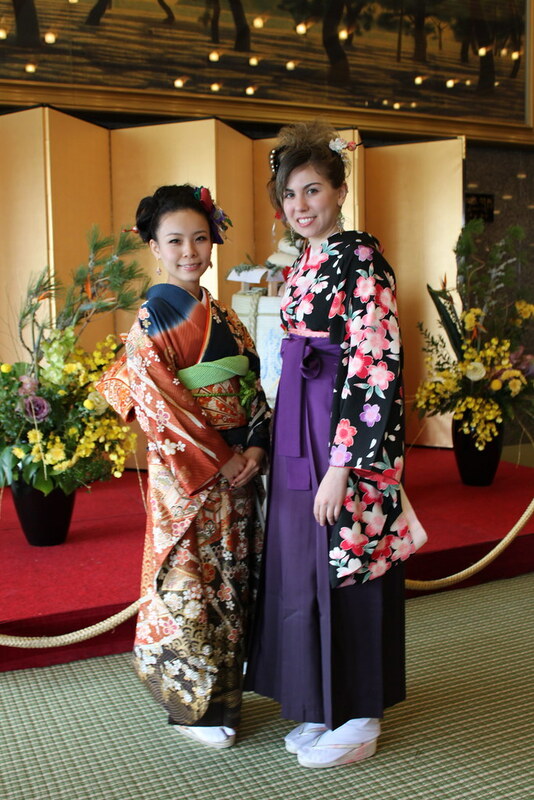 …Noriko and I were all dolled up, seijin-shiki-style, and met up at the Hotel Okura in Kobe where Noriko had been dressed, and take some nice photos, courtesy of ojiichan’s nice camera and photography skillz, plus extra help from host mom and obaachan. 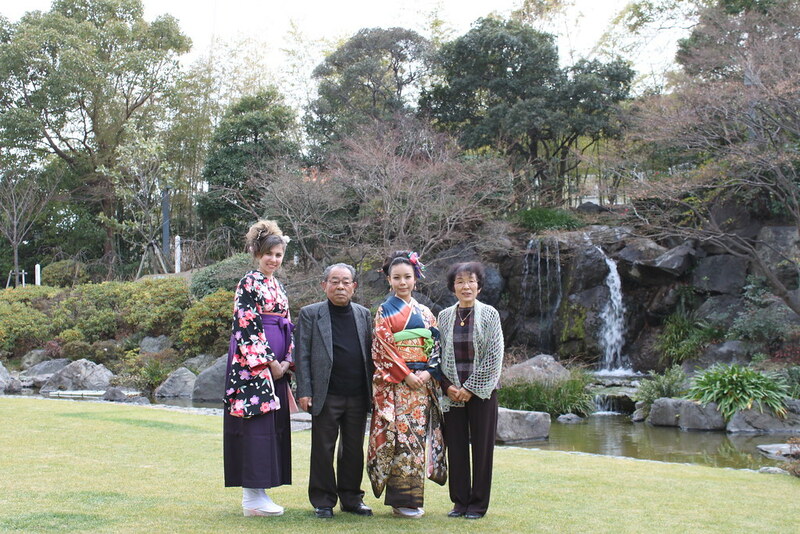 Met up with Noriko’s friend Sayuri and her family. Good to see them for the first time in several years too. 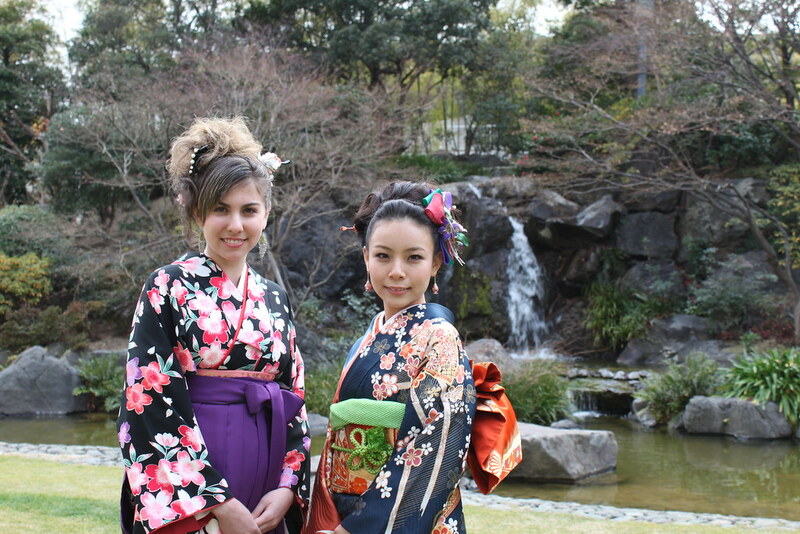 Next stop: photography in the conveniently-placed Japanese garden right behind the hotel. It was not very cold, but you can tell it’s winter because there would probably be more leaves on the trees otherwise…? 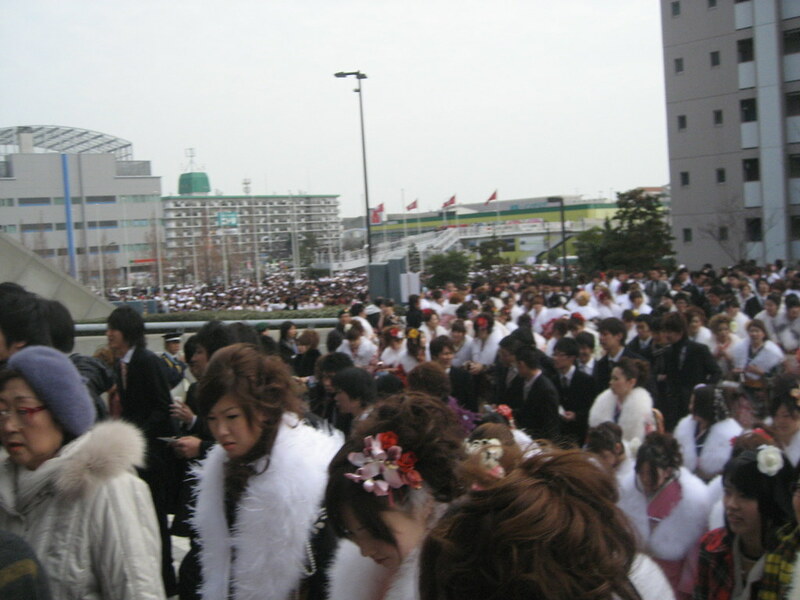 As we approached the stadium, we were surrounded by every single other 20-year old in Kobe. That’s a freaking lot of people. 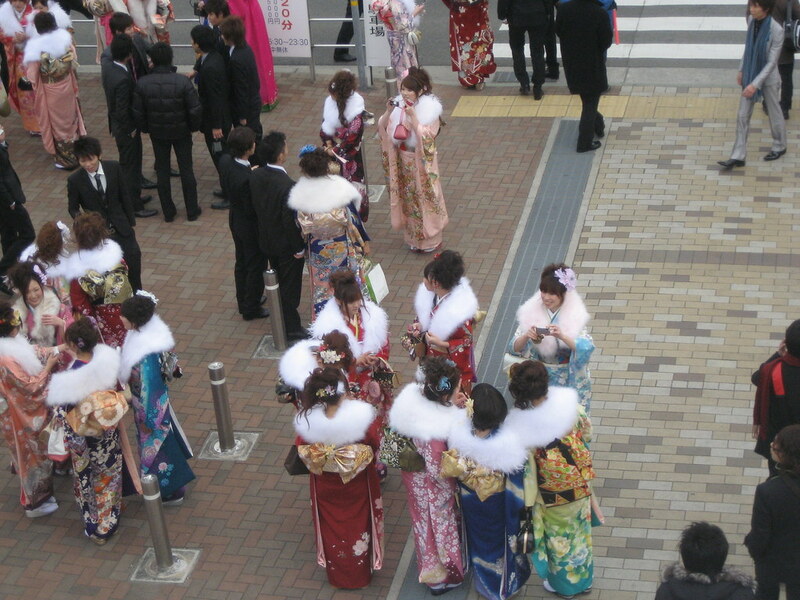 On seijin day, girls wear furisode and guys typically wear suits. 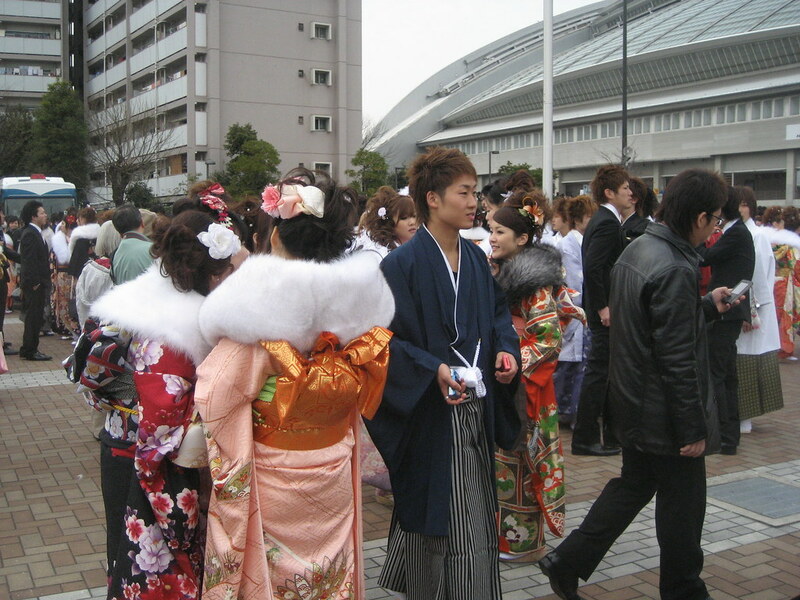 Some guys, however, choose to wear something more traditional and go with the male version of a hakama, like what I’m wearing. However, as Noriko pointed out, those are usually the kinda guys who are really 調子乗る, or think they’re bad-boys and can pull anything off. 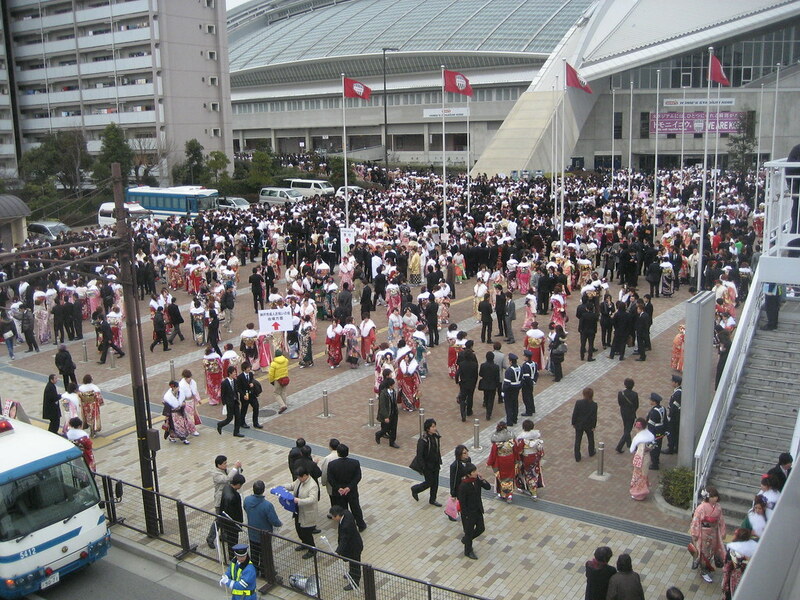 As a result, nice-boys specifically avoid being seen in hakama on this day because they don’t want people to think they’re trying to look badass. 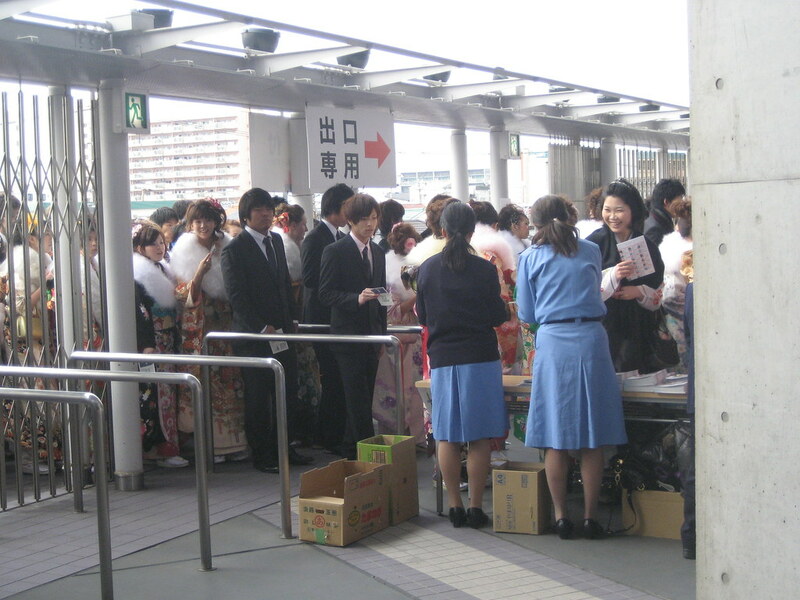 And as it turned out, most of the guys who showed up in hakama did have that “I wanna be baaaad” edge. 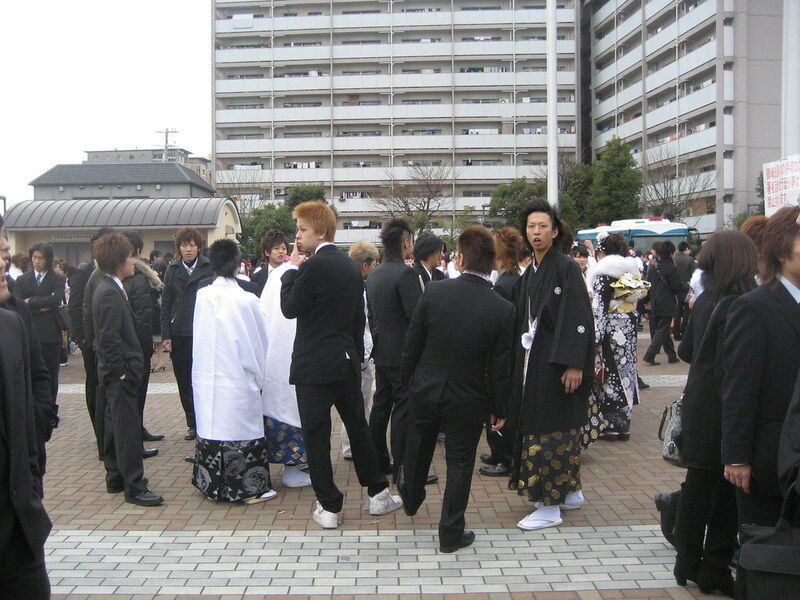 Above-mentioned boys in hakama. Or at least suits and white sneakers. 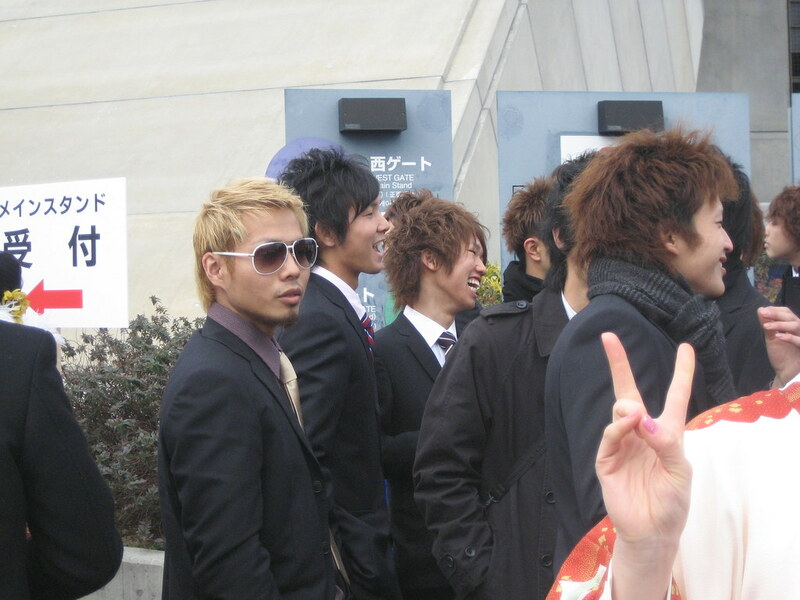 The rare blonde hair and sunglasses look. 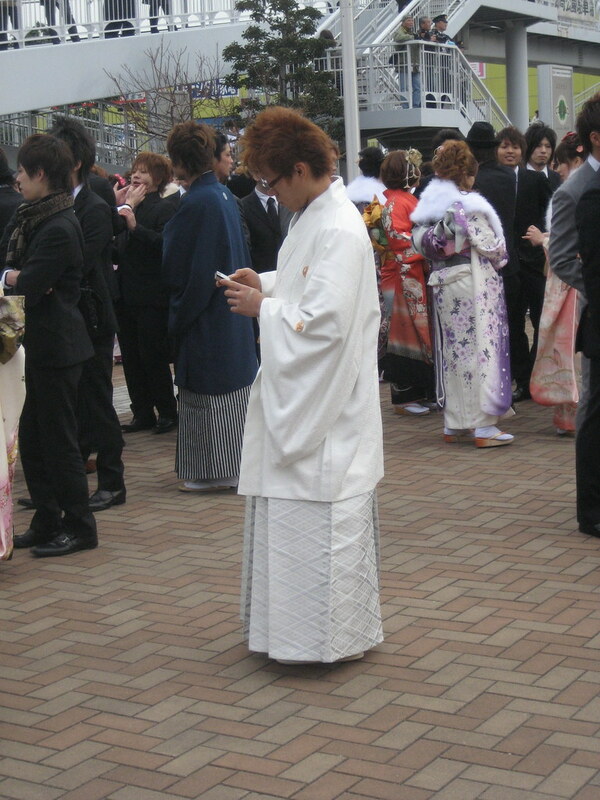 I’m not sure where he falls on the spectrum of hakama vs. classy suited boys. 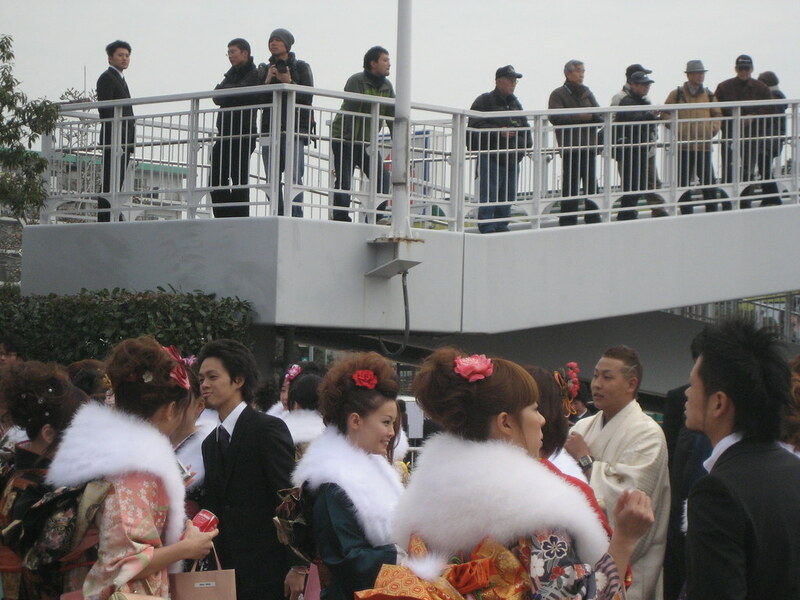 ossans and photographers watch from the bridge. 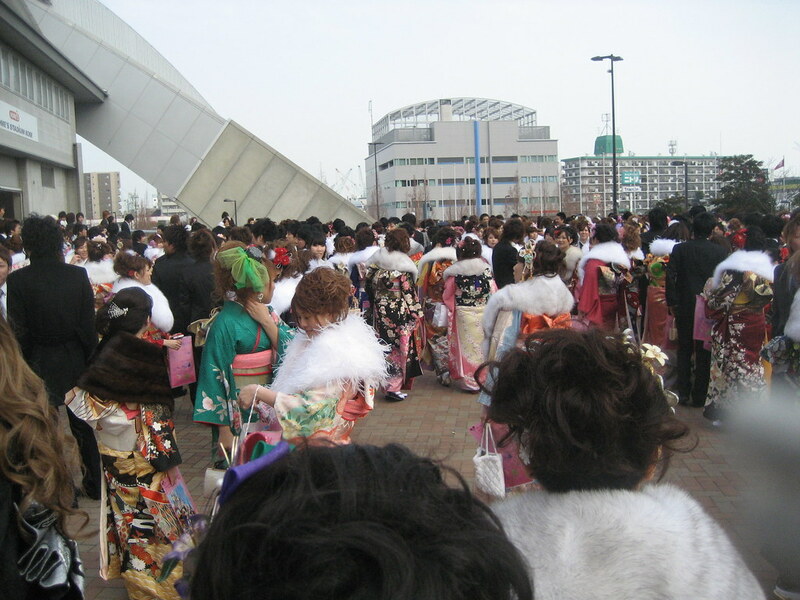 The main thing going on was just to stand around in this giant crowd of kimono and suit wearing 20-year-olds. 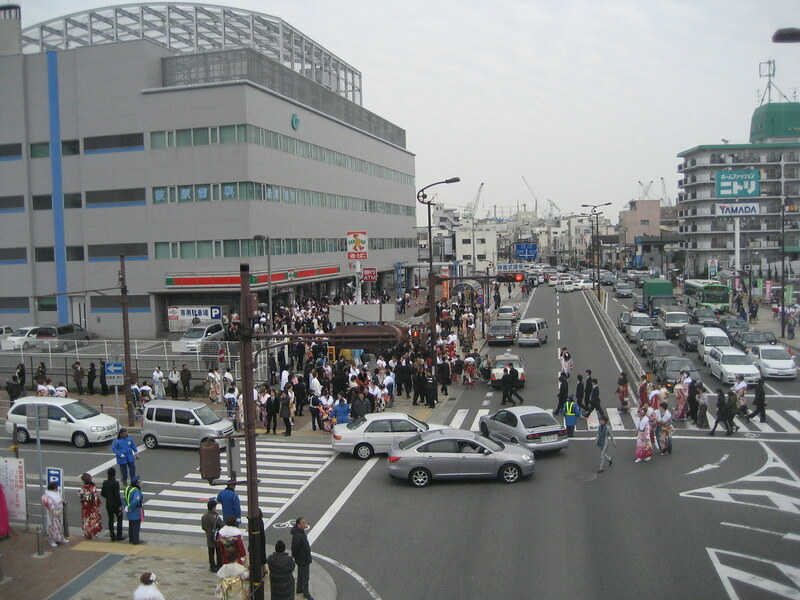 The event is held town-by-town, so my friends kept running into people they knew from elementary school, since most people go to nearby schools when they are little, and then farther away for middle/high school. 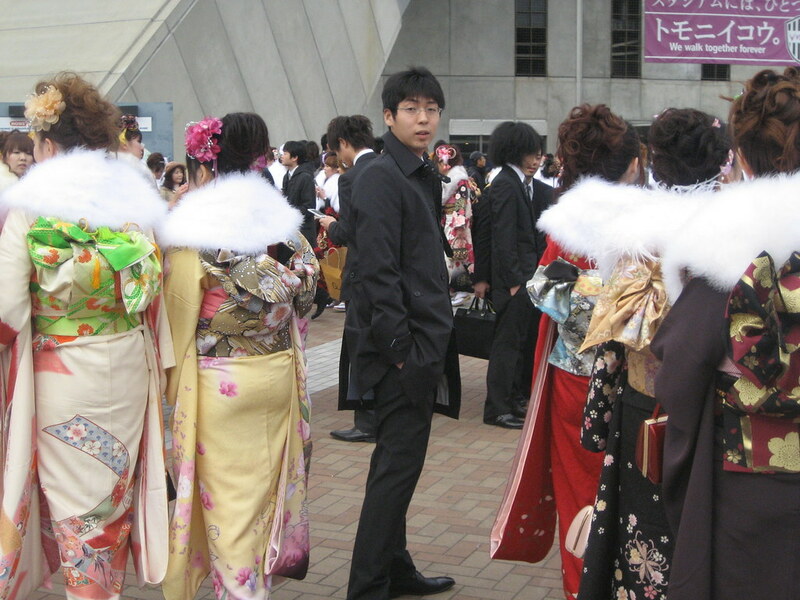 Dude amidst many ladies in kimono and those white furry things. View from the front of the line! 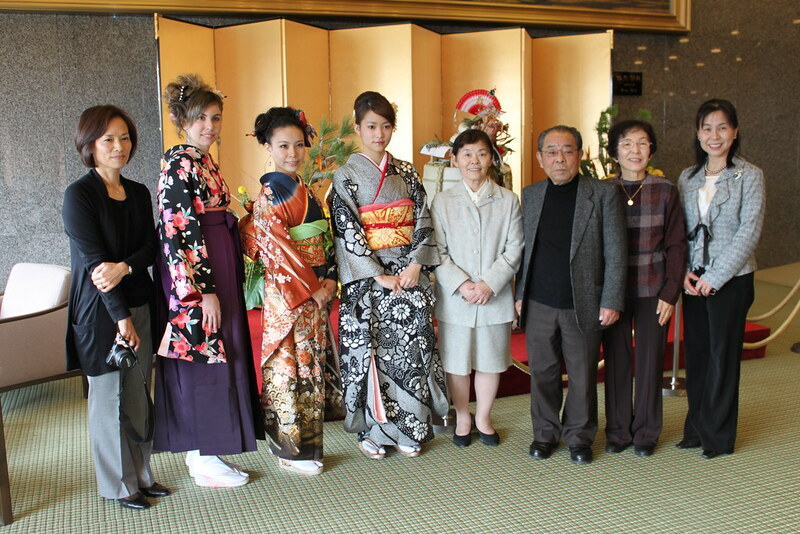 You have to show your invitation to the ceremony at the door (proof you’re a new seijin, I guess). This is the part where this whole ceremony is a bit of a mystery to me. 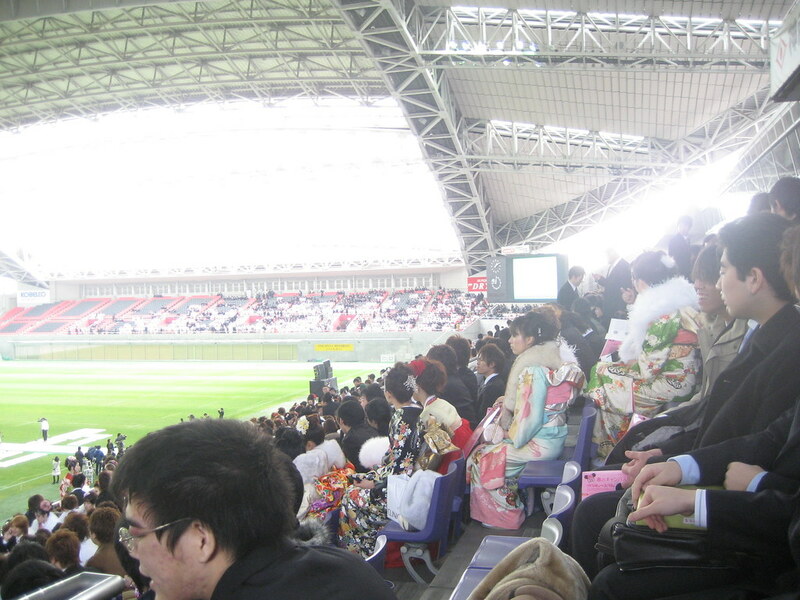 Some dude welcomed us, there were people standing at the bottom of the stadium, but nothing of interest was going on. There was about a 5 minute dance performance, aaaand that was about it. We decided we were bored after about half an hour and left. Finally, across the street from that massive crowd. Noriko’s mom came to pick the four of us up, and we headed to their apartment in Sannomiya to chill out for a few hours before the high school reunion. I went shopping for a last-minute gift (this was the day before I left Japan). 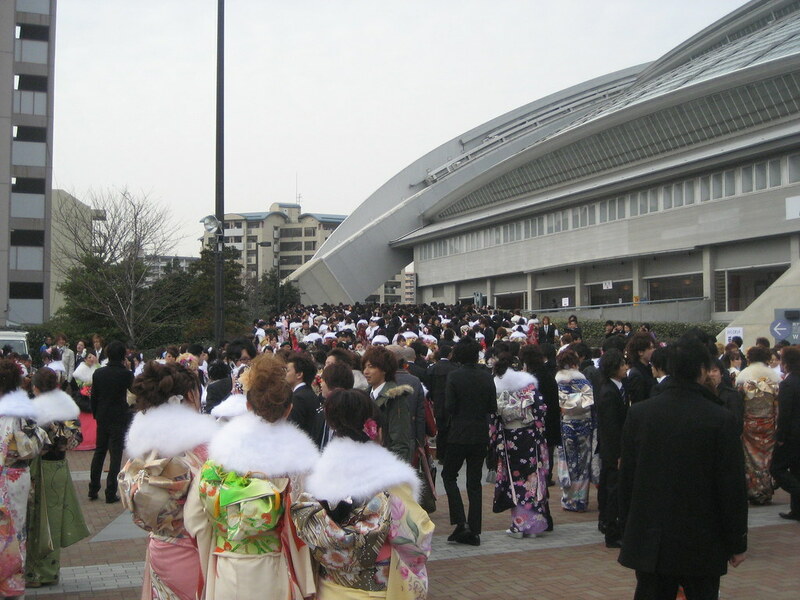 However, in Sannomiya, unlike by the stadium in Kobe, most people were NOT dressed up in kimonos, so I stuck out like no other. The stares were the normal amount of staring (due to my foreign-ness) multiplied by a factor of 1000. I even got verbal response (this is extremely rare). Some kids complimented me (they were about 13), and later I came upon a middle-aged dude who saw me and completely stopped in his tracks. Speechless. I stared back, and eventually he realized he’d been staring long and intensely enough that some kind of verbal interaction was required. He stammered 似合う (looks good on you) and got out of there. Sad as it was to break up this powwow, it was HIGH SCHOOL REUNION TIME. 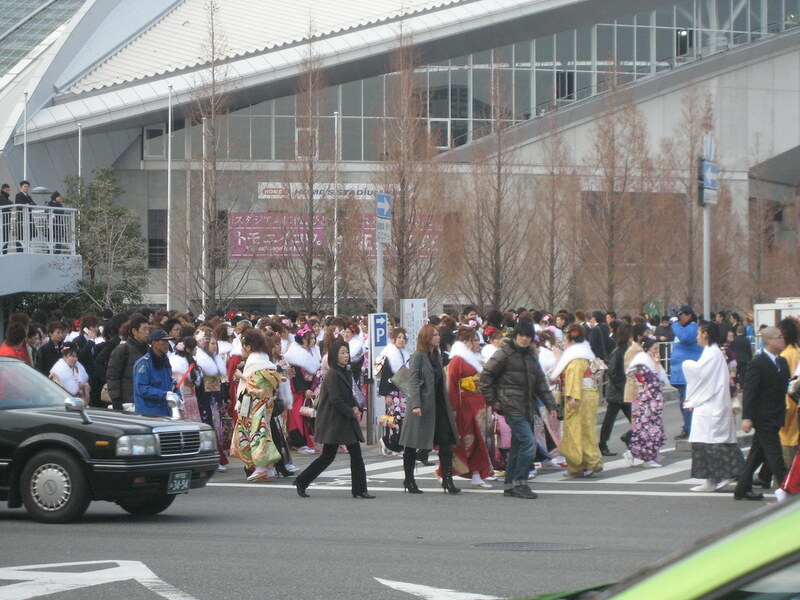 So once again, we piled into the car and headed for Hotel Okura. 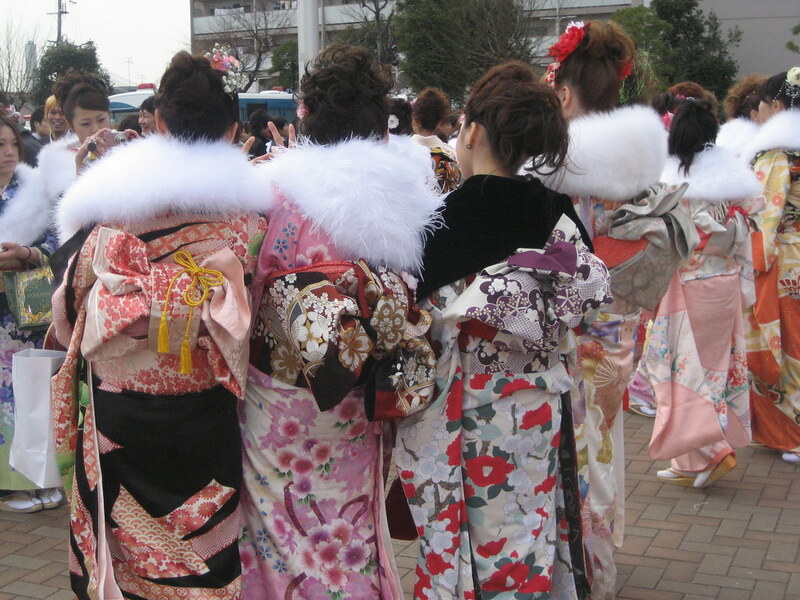 so nice, what type of kimono set are you wearing with the hakama??? 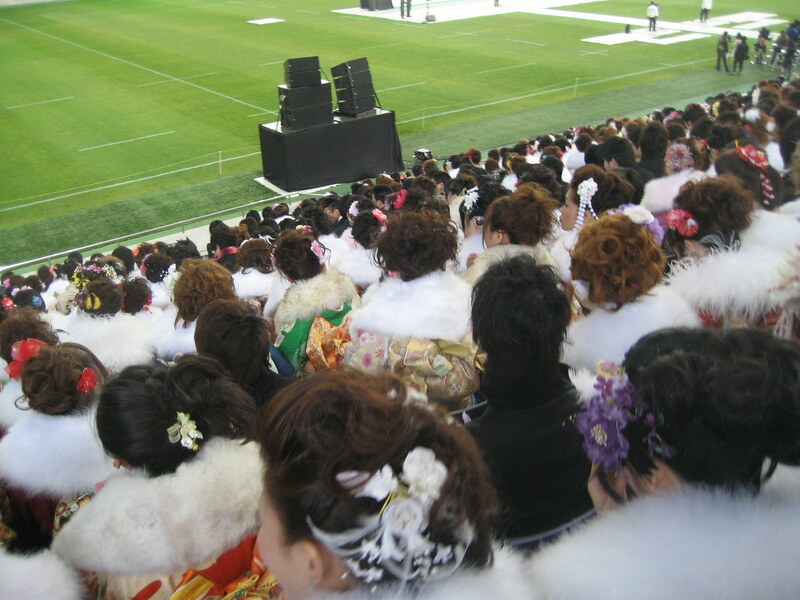 Hi, I’m planning on going to Japan for a year of exchange, and I was wondering was it hard to organise the seijinshiki? 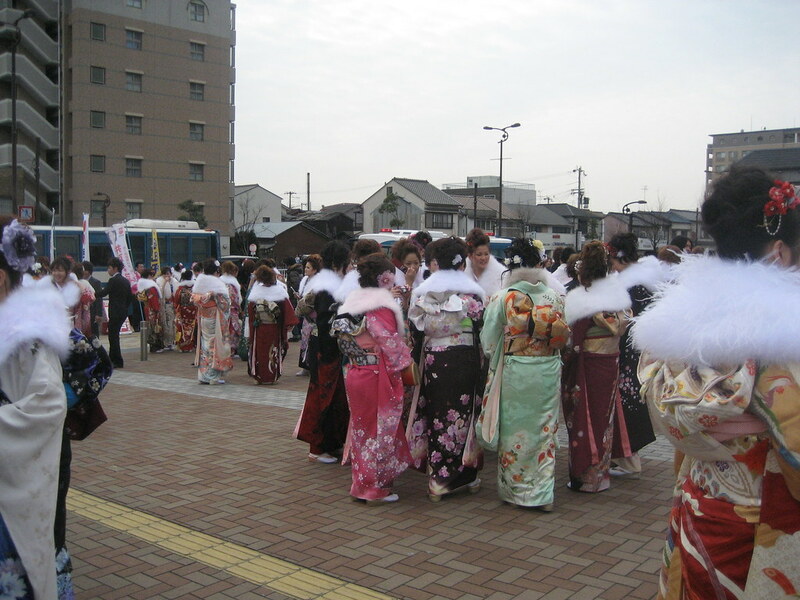 I’m going to be turning 20 when I am there so I’d really love to participate in the Seijin-shiki. Great photos and getting good crowds also. Clear and great style can be applicable for this post. Planning and wonderful turning to given for best opportunity for the guys. Good occasion and great pleasure to see the photos here. Pick good and quality and rare types of materials are getting from online shopping. You are given for the best story for the readers here. The wonderful words and i have understand great line from its. Thanks for sharing your experience here.